There are many ways to have fun in a Candy Apple Red 1968 Ford Mustang GT Fastback 2+2 equipped with the new for ‘68 302 small block V8! 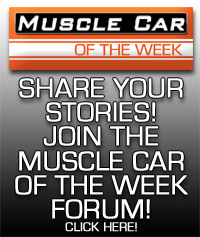 This week, we take one for a spin on Muscle Car Of The Week from The Brothers Collection. Wheels are among the first things you notice when checking out a car, and they can make a huge impact on the car’s attitude. Some are flashy, others mundane, but Muscle Cars have had them all. Today, we’re taking a look at 10 favorite wheels from episodes of Muscle Car Of The Week found on cars in The Brothers Collection.